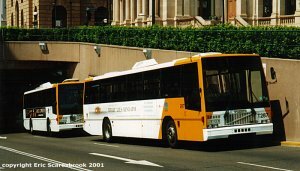 Brisbane City Council operates bus services in most of the Brisbane metro area under the title of Brisbane Transport. There are more photos here. 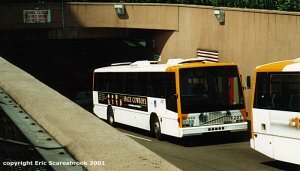 A queue of buses led by bus 867 in Fortitude Valley, 6 October 2000. 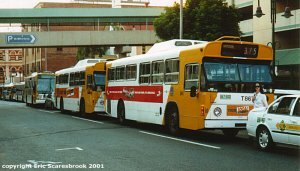 Volvo 287 (front) and Volvo 227 (rear) wait out of service at the Queen Street Busport, 08 October 2000. Volvo 227 waits out of service at the Queen Street Busport, 08 October 2000. 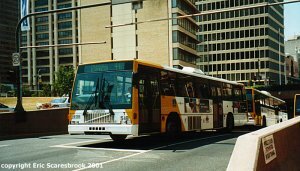 Volvo 518 leaves the Queens Street Busport, 08 October 2000. Volvo 266 on Roma Street as photographed from above (from the nearby Quest on Quay Apartments). 6 October 2000. 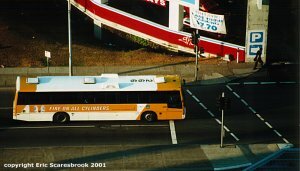 Bus 408 on Roma Street as photographed from above (from the nearby Quest on Quay Apartments). 6 October 2000.